Registation is now open for a seminar organised by the Valletta 2018 Foundation and Inzjamed for the Poetry on Film project. The project sees poems by Maltese poets translated into poetry films which premiere at the Malta Mediterranean Literature Festival. The seminar, which will be held at Studio Solipsis in Rabat on the 24th of March, introduces prospective directors and filmmakers to the poems chosen for this year. It will run from 9am till 12pm and includes an introduction to the Malta Mediterranean Literature Festival and poetry films by Dr Adrian Grima, followed by a close reading of the poems by Dr Immanuel Mifsud and a discussion. Screenings of local and foreign poetry films will also be taking place, namely the films by Nicky Aqulina/Lyanne Mifsud and Trevor Borg who will also be present for the seminar. Participation is free of charge. To apply for the seminar, please fill out this form by the 23rd of March. 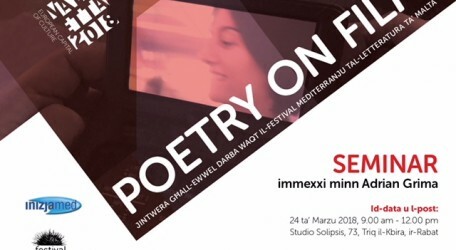 Following the seminar, a call for proposals will be published for two poetry films of four to eight minutes in length to be produced and shown at the next edition of the Malta Mediterranean Literature Festival (23th-25th August 2018, Fort St. Elmo). A grant of €3,000 is being offered by the Valletta 2018 Foundation and Inizjamed for the making of each film. Applicants are to choose one of the proposed poems. The six poems, chosen by Immanuel Mifsud as literary consultant for the Poetry on Film project, are those of Oliver Friggieri and Achille Mizzi. Following the submissions, there will be a process of selection. The deadline for the final proposal will be the 8th of April and the pitch will follow on the 14th of April. The two selected proposals, one focusing on each poem, will need to be translated into film by the end of July. Participants who have produced films for the Poetry in Film project in the past may also submit proposals. The choice of applicants is left to the discretion of the jury. All the documents related to the project are found on the Valletta 2018 website.